During this past Fall my co-worker Danielle was inspired by the Burpee Challenge to do a handstand push-up challenge. The purpose was to improve her strength and stamina and see what other benefits might occur. I happened to be doing some handstand push-ups with her, and I decided join the challenge. Danielle and I agreed to start with ten handstand push-ups (HSPUs) and would continually add one everyday until we achieved 100, thus a Handstand Push-up Challenge. Unfortunately, Danielle had to drop out because she developed a cyst in her hand and needed surgery. I decided I would continue the challenge. I was rather hesitant to agree to this challenge. 1) My elbow tendonitis continued, but did not worsen. I made it a priority to have a massage at least once a week during the last month to help alleviate pain and improve recovery. 2) During the last month, the number of HSPUs I was doing consumed my upper body routine. In the midst of several workouts, my elbows would flare up. Therefore, I stopped doing most pulling movements to allow my elbows to recover. 3) I did not notice much improvement in my upper body size. However, I felt stronger and had more stability while performing overhead movements, such as overhead squats, jerks and push press. Unexpectedly, my 1 repetition max (1 RM) bench press (which I avoided for most of the HSPU Challenge) did not decrease. In fact, it might have improved, but I do not know for sure because I did not test my 1 RM bench press prior to starting the challenge. 1) I could complete 25 HSPUs in the midst of changing my clothes; a great time saving skill. 2) I could impress friends, and sometimes embarrass them, by performing HSUP at parties and other social events. There is only so much time in a day to complete 80+ HSUPs. I have been asked if I would do it all over again? I am not sure if it was totally worth it, but it was fun. It feels good to say I did 5000 HSPU’s in three months, and you can impress a number of strangers at casinos, or while waiting for elevators with HSPUs. Perhaps allowing for more recovery days would have been beneficial, or may be I did not have to perform as many HSPUs to achieve the same benefits. I realize that I do not do enough overhead movements in my own training and that may be one of the reasons the benefits were so impressive to me. Again, are 5000 HSPUs needed to achieve greater upper body strength and stability? I do not believe so, intelligent training would certainly create the same benefits and perhaps with less tendonitis in my elbows. That is the art of to training: creating the most optimal results efficiently, without injury. 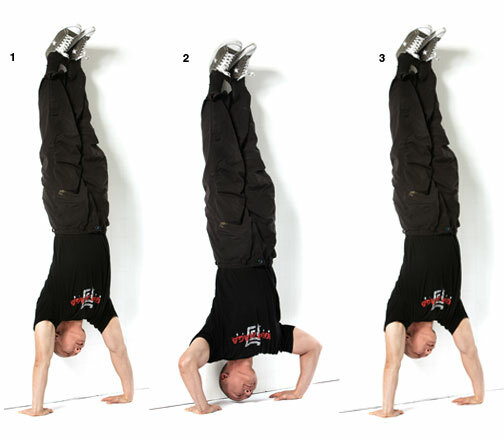 This entry was posted in Exercise and tagged exercise, handstand Push Ups, upper body strength.